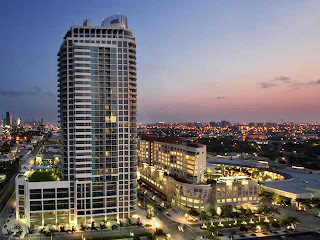 Just south of the Miami Design District sits an area known as Midtown Miami, a mixed-use urban development. Although construction of the development began in 2005, the real estate crash forced the developers to scale back on some of their plans in 2007. By the summer of 2011, however, new plans were announced for the building of an entertainment center, a hotel, cinema and additional shops. The Shops at Midtown are probably the area’s biggest draw and include national chain stores such as Marshalls, Target and Guess, as well as popular local stores. If the Shops at Midtown remind you of New York’s SOHO district, there’s a reason: the shopping area was designed to do just that. 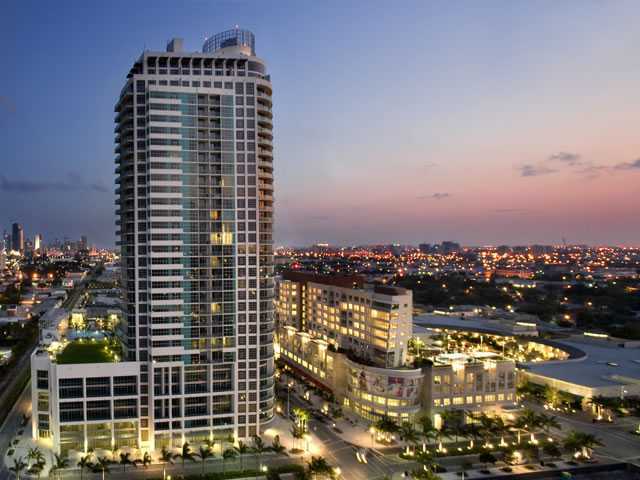 Midtown Miami is also a draw for residents seeking an upscale lifestyle in an urban setting. Let’s look at some of Midtown’s real estate offerings. Also known as Midtown 2, this residential complex was built in 2007 and contains 336 units with 60 floor plans. The Mews offer 18 first-floor, live-work residences, Midrise contains 62 live-work residences with distinctive warehouse-style windows, and Tower units offer 327 residences with stunning bay and city views. All units offer floor-to-ceiling windows, custom cabinetry in the kitchens, high-end appliances and walk-in closets. Amenities at 2 Midtown Miami include a concierge, on-call 24 hours a day; 24-hour security; a private fitness center; swimming pool; private storage; a valet and shopping just steps away. Current offerings range in price from $225,000 to $905,900. At the lower end of the price range is a 589 square foot one-bedroom unit with tile floors throughout. At the top of the 2 Midtown Miami price range is a 3-bedroom unit with three and one-half bathrooms in 3,730 square feet of living space. This residence offers a European kitchen with stainless steel appliances. 4 Midtown also offers 24-hour security, a movie theater, a breakfast café, concierge services, a wine cellar, steam room and sauna. Prices at 4 Midtown start at $239,000 for a studio unit (with a den). At the top of the price range sits a two-bedroom condo with partial bay views, offered at $375,000. If you think Midtown developers are finished, think again. Earlier this year they announced the sale of 22 acres to another developer. Look for more retail and additional residences in the future. Thanks for sharing information on apartments for rent in Miami Florida. The article recommends for sellers, no matter the time of year, to work with potential buyers' schedules. Flexibility goes a long way, especially when both parties have to drive kids to sporting events, work, and find time to travel to look at a home. Thanks. This is really a nice blog. Each word of the blog was meaningful and helpful too. I really appreciate the author for the hard work done to represent about apartment for sale in Miami.I found this type of blog at Prestige International.